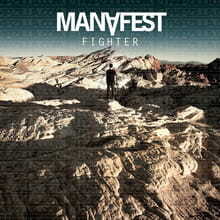 Drawing from the same industrial rock and rap-core templates set forth by predecessors P.O.D., Skillet, and Linkin Park, Canadian rock artist Manafest’s fifth label studio project, Fighter, is a blistering set of tunes that swings hard, but doesn’t quite land a knockout punch. Album opener “Come Alive” features a crunching rock intro which gives way to a reverb-heavy rhythm guitar that instantly calls to mind the work of P.O.D. guitarist Marcos Curiel on the band’s seminal Southtown album. The song lays down the blueprint for Fighter: tracks with an uplifting message that, as the title would suggest, deal predominantly with overcoming adversity. As Manafest sings on the chorus to the title track, “You can say I’m done, but this is just begun. I’m a fighter, I’m not afraid of death, you ain’t seen nothing yet.” The hard-knock life persona suits Manafest’s aggressive delivery. He uses a rap-style delivery on the verses, then shifts into singing for choruses. It’s similar to the approach favored by TobyMac on occasions throughout his solo work. Despite Manafest’s simmering intensity, the production of Adam Messinger and Seth Mosley doesn’t provide these songs with enough personality, leaving the mix just short of a rock snarl when that would be called for, and other times scrubbing the mix up to a pop sheen. What Fighter does have going for it is its singular thematic focus: the tenacious will to stay on top of life’s struggles and setbacks, a topic about which Manafest himself—judging from his personal biography—knows a thing or two. This one-two punch of blazing spirit and back-against-the-wall verve could just be the thing that endears Fighter to fans.